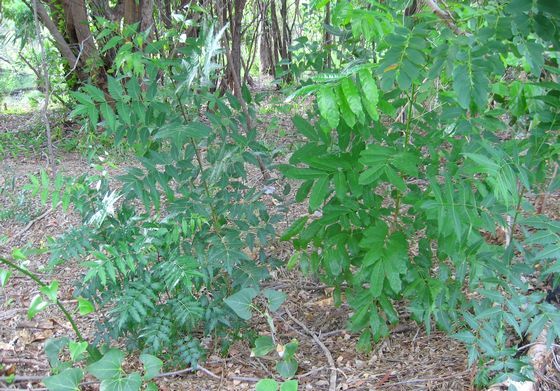 Neem: "Wonder Tree" or Noxious Weed? and wildlife in northern Australia. Neem has been cultivated for thousands of years for its medicinal properties. In its native environment (eastern India and Burma) that did not present a problem. However, recently neem has also been introduced in countries where it previously was not at home. First the tree spread to parts of Africa, where it now dominates large areas of savanna. People were lured by the tree's medicinal properties and the economic potential of neem oil. Agricultural products, soaps, toothpaste and medicines are derived from the tree's leaves, bark and seeds. As someone who lives in a supposedly pristine wilderness area I have been able to witness the devastating effects of these plantations first hand. Neem certainly is not the first noxious weed to threaten the remote Kimberley region in Western Australia, but it is one of the most invasive and fastest spreading. Neem trees were first brought to the Kimberley in the 1990s by the Department of Agriculture. But the trees were not confined to their trial plot near the small town of Kununurra. Many town residents managed to get hold of seeds and seedlings and planted the intriguing "wonder tree" in their gardens. Farmers used them in windbreaks, and everybody appreciated the attractive, fast growing shade tree that thrived in our harsh climate, with no fertilizer, no water, no nothing . It only takes a few years for neem trees to start fruiting, and our native birds quickly took to the sweet flesh of the seeds. As you can imagine, the birds deposited the seeds everywhere. Young neem weed trees and mahogany weed seedlings in the bush. Too healthy! Fast forward fifteen years. If you go for a drive in the bush areas around Kununurra it won't be long until you come across giant, many hundred years old boab trees, hardly visible any more, being choked to death by hundreds of neem seedlings that germinated beneath them. Neem flowers have a beautiful scent. Go for a cruise on the Ord River when the trees are flowering. The sweet smell is thick out on the water, the river bank is firmly in the hands of neem. Neem trees are incredibly vigorous, lush and green, even during the driest and hottest time of the year. They are easy to spot in the bush, and they are everywhere, choking and displacing the native vegetation, depriving native animals of food and habitat. Neem trees also changed the way fires affect the vegetation. They grow around the base of native trees (below where birds sit and roost). In bush fires they provide extra fuel and create intense heat around the trunk and under the canopy, killing native trees that would usually survive such a fire. 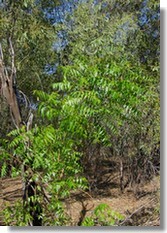 The photo shows neem reshooting at the base of a native tree after a bush fire. Even if the native tree survived, the neem tree will outcompete it easily. "It is important, however, to take immediate action to minimise the risk of further infestations establishing, and to at least contain the existing infestations. Because the extent of current infestations is unknown, it is unclear whether the invasion has already progressed beyond the point where eradication is still possible." "There is a need for immediate policy measures and actions to remove the risk of further infestations developing, to document the scale of current infestations, and put in place strategies for containment or, where possible, eradication." 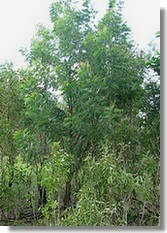 Kununurra started a State Government funded neem eradication program in 2006. People started to cut down and kill trees around town and the surrounding areas. Though the impact is certainly visible, I wonder if it isn't too late. 1. 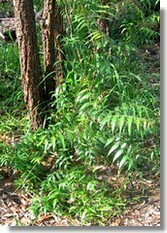 Neem is easy to spot in the bush. It's always that little bit greener. 2. After only three years these young neem trees have overgrown the native trees underneath them. 3. Neem seedlings at the base of native trees. There are now many sources of neem populations across the north of Australia and there is no way we will ever contain or eradicate all the trees. It is far, far too late for that. And unlike Kununurra residents most Australians are not aware that neem is such an invasive weed. Some councils have banned people from planting neem trees in gardens, but you don't need to go far on the internet to find organic gardeners and well meaning permaculturists advising each other how to fight the councils on that and how to escape those regulations. Neem is still available in nurseries in Australia. It may be hard to understand the bans. If you live in a developed and densely populated area you won't see the havoc wrought by these trees. It's ironic: especially people who claim to care about the environment contribute to its rapid destruction. If you live close enough to the bush for neem to escape (birds will spread the seed over several kilometres) and you have to grow a neem tree, please make sure it never ever sets seed. Neem can easily be grown for the leaves only. It responds very well to coppicing. Just cut it right down when it is about to flower. Going on a holiday? Cut it! It will have grown back by the time you return. Unless you can guarantee that the tree will never ever set seed, kill it. Young seedlings can easily be pulled up. Older tress need to be cut down and the stump painted with a herbicide. Otherwise the tree will quickly grow back. If you find you can't bring yourself to do this, please visit the East Kimberley or any other wilderness region that is infested with neem. After seeing what neem does when it escapes you should find it easy to get rid of your tree.